It’s not like you need another carb for your Thanksgiving dinner, but I’m giving you one anyhow. After all, once a year you should be able to engorge yourself with anything and everything on the table without an ounce of guilt, right? 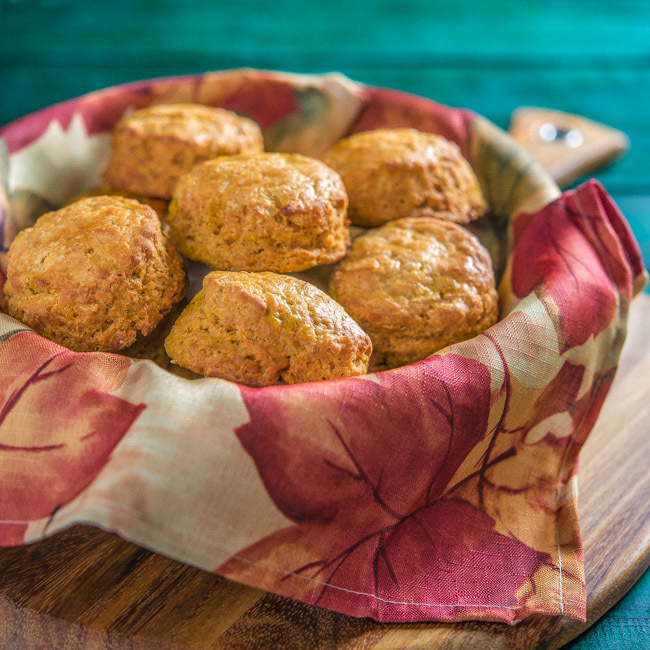 I don’t think it would be Thanksgiving without some form of bread, so I’m offering you some delightful sweet potato biscuits with hints of maple syrup and cinnamon. We always enjoyed Thanksgiving at my grandparents’ house. I’m not sure I ever had a meal that my grandmother prepared where she didn’t have a pan of hot biscuits on the table, and Thanksgiving was no exception. The table always bowed under the weight of the Thanksgiving bounty she’d prepared, and biscuits were certainly not required. However, the table wasn’t complete without them. Biscuits were somehow the finishing touch on the feast. I’m going pretty traditional for Thanksgiving this year, and these sweet potato biscuits with lots of butter will be on our menu. I’m trying my hand at a fried turkey, and I’ll complete the menu with cornbread dressing, sweet potato casserole, and green beans. My Dad requested a pumpkin pound cake, and I’m happy to oblige. I’m looking forward to spending time with my family. I hope you all have a very happy Thanksgiving and by all means give yourself permission to overindulge! 2. Cover large baking sheet with parchment paper. 3. Sift flour, baking powder, baking soda, salt, and cinnamon into a large bowl. 4. Place flour in the bowl of a food processor. Add butter and pulse until mixture looks like coarse crumbs. Some larger pieces of butter are fine. Transfer flour/butter mixture back into bowl . 5. Whisk buttermilk, sweet potato, and maple syrup together until well combined. Pour mixture into dry ingredients. Gently fold into flour until dough comes together. Do not over mix. 6. Turn dough onto a floured surface and roll out to a 3/4 inch thickness. Cut biscuits with 2 1/2 inch biscuit cutter and place on baking sheet. Cut as many biscuits as possible and then form scraps into another disk and continue cutting. You should end up with 12 to 15 biscuits. 7. Brush tops of biscuits with buttermilk and place baking sheet on rack in the middle of the oven. Bake for 12 to 15 minutes or until to tops are golden brown. 8. Serve immediately with butter. Oh this recipe was meant to be made in this kitchen! Bobby was asking me just this morning if I had a recipe for pumpkin biscuits. Not sure where the question came from but I find it some good karma that he asks and here you provide 🙂 These look like some good old southern biscuits with a twist! Thanks Bill! I too grew up in the south and my family enjoys having biscuits with meals. Thank you so much for this recipe; looking forward to trying it. I just recently discovered your website and have enjoyed reading your posts & trying your recipes; so glad I found it. Happy Thanksgiving to you and your family. Thank you so much, Becky! I really appreciate you dropping by SBD and I’m so glad you’re enjoying it. Happy Thanksgiving! I want these now! I can’t wait for Thanksgiving for them. Love your description of your grandmothers table bowing under the weight of the feast. Great imagery! Thanks, Katie! They’re perfect for the holiday! Hope you and your family have a great Thanksgiving!